Mornings are crazy for me. If I don’t have a plan or have something ready to go, I am running behind when I should leave for work. Lucky for me I know different routes to work and have a little padding on when I would like to leave and the latest time I could leave to make it to work. One way I help with making sure I have breakfast is to make smoothies. Getting the ingredients together in the morning can be challenging. Sometimes my high powered blender has a fit and refuses to blend the ingredients. That doesn’t help getting out the door on time. So what can be done to make sure I have a smoothie in the morning? I could make some ahead of time and then put them in the freezer. The only problem with that solution is remembering to pull out the smoothie of the freezer so it could defrost so I can drink the smoothie. Another solution is to prepare smoothie kits so all I have to do is pull the bag out of the freezer and then add the liquid ingredients. I’ve started to do it and it makes life so much easier. Place all of the ingredients in a Ziploc type of bag. 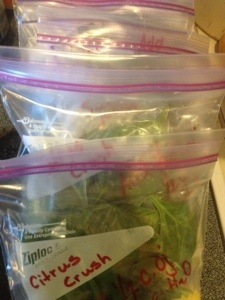 If you are going to make a green smoothie, place the greens in a sandwich bag. Then place the sandwich bags in the Ziploc with the other ingredients. Place the smoothie pack in the freezer with instructions of what liquid needs to be added to the other ingredients. Place the greens with the liquid in the blender cup. Blend up the greens and liquid until smooth. Add the other ingredients with the greens and liquid. If you need more liquid, add a little water until all of the smoothie is blended.